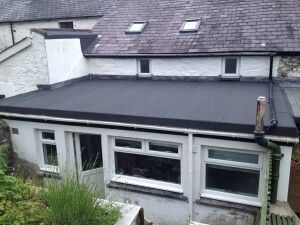 Darryl Hayday has more than 25 years experience in laying and repairing flat roof’s, Hayday Construction & Roofing can offer an unrivalled service to West Wales. Over the last 19 years we have laid more than 40,000 square meters of high performance roofing on roofs ranging from small garages and outbuildings up to large scale industrial flat roofs. Flat roofs by Hayday Construction & Roofing typically come with a 25 year guarantee so you can rest assured your roof will last well, whatever the weather. 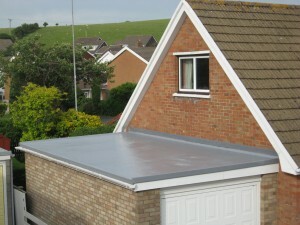 We also provide flat roofing repairs, flat roof advice and professionally backed industrial flat roofing services. Hayday Construction and Roofing Services are specialised in the installation of high performance torch-on flat roofing, plus associated insulation and ventilation. The improvements in the manufacture of APP and elastomeric torch-on membranes over the traditional old fashioned felts are beneficial both to the installer and the consumer. They have given the product a longer life and ensure that expansion and contraction of the actual roof structure will not impede the performance of a quality APP roofing system. There is no comparison between these products and the traditional products, of bitumen which is boiled and poured, sandwiching rag-felts which have no residual strength and become too brittle to cope with deck movement, also APP membranes are not affected by U.V. The scientific improvements in composition and manufacture gives these polyester reinforced product an anticipated life of 40 years plus by applying APP modified bitumens to give a rubberized quality and incorporating a polyester spunbound core with a special backing adhesive, this product when heated with a flame torch, gives us a perfect control for even adhesion to many types of roof deck surfaces, vertical parapets, tank linings, gullies and irregular shapes, which can be weathered with these remarkable product. The polyester core gives the product strength and the overall elasticity to cope with the expansion and contraction of the roof deck. The product is self finishing without the need for stone chippings. The value of these modern APP products are now well known to the architectural profession and we have installed for discerning organizations such as local authorities, factories, residents associations, schools and hospitals, not to mention 1000’s of domestic jobs such as garages, extensions and porches etc. The full 2 layer specification is anticipated to last for 40 years plus on flat roofs. In some instances a 2 layer system has to be used. Single layer systems are particularly suitable for overlay or on pitched roofs, asphalt or standard felt roofs, provided these have not been leaking for too long. Whilst we have been using APP Polyester torch on membranes for 20+ years, we have been fitting at the clients request many other systems such as fiberglass and rubber, however we find none as versatile and problem free as a good quality APP Polyester membrane.